Prime Nutrition Agmatine is dietary supplement that contains pure agmatine sulphate AgmaPure®. Due to its properties increasing the production of nitric oxide (NO) and intensifying the muscle pump it is used mainly by athletes. Agmatine presents also other properties that not only increase the body's exercise capacity, but also effectively maintain the health. The patented form of AgmaPure® that was used in this supplement is one of the purest forms of agmatine sulphate, formed in natural fermentation process. Agmatine, or decarboxylated arginine, has been known to scientists for more than 100 years, and its endogenous production and impact on the human body are still an interesting topic of today's research. It has been recently demonstrated that mammalian organisms are able to biosynthesize it, which indicates its unique modulation effect in many intra-vitro mechanisms, including neurotransmission, nitric oxide (NO) synthesis and polyamine metabolism. These findings provide the basis for a wide range of its medical applications. There are many possibilities for the therapeutic use of agmatine including: treatment of diabetes, neurodegenerative diseases, opioid addiction, mood disorders, cognitive disorders or cancer. The main mechanism of action of agmatine in the human body is the regulation of 3 key enzymes that produce nitric oxide: iNOS, nNOS and eNOS (NOS - nitric oxide synthase). iNOS inducible generates large amounts of NO for the immune system so it neutralizes aggressive pathogens. If it is too active it can cause inflammation. By inhibiting excessively active iNOS, agmanite plays a key role in regulating levels of nitric oxide what reduces inflammation. nNOS neuronal is a signalling molecule facilitating communication between neurons in the brain. If it is too active it can limit the growth and repair of neurons. By inhibiting too active nNOS agmatine plays an important role in regulating levels of nitric what supports brain functions and neuronal transmission. eNOS endothelial (endothelial) signalises the vasodilation in the the blood vessels lining that occurs to increase blood flow. Increasing the lumen of blood vessels reduces blood pressure, increases the supply of oxygen and nutrients and helps in the excretion of residues. By increasing eNOS, agmatine plays a key role in regulating the level of nitric oxide what supports cardiovascular system functioning. Agmatine also has a number of other properties. It activates the Nrf2 pathway that increases the production of antioxidant proteins protecting against oxidative damage. It blocks the glutamate receptor (NMDA) by binding to 2 sites of this receptor and prevents the binding of glutamate to them what stops the excessive neuronal irritation. Low dose of agmatine enhances the activation of the alpha-2 adrenergic receptor causing body stimulation. Agmatine activates imidazoline receptors increasing the release of beta-endorphin, the activators of opioid receptors that reduce the feeling of pain, improve well-being, and regulate behaviour in response to pain, stress or anxiety. In addition, agmatine participates in the regulation of the rapamycin pathway (mTOR) enabling the growth and survival of cells and protein synthesis. Apart from the wide range of applications, agmatine also positively influences physical exercise and its ergogenic effect. Thanks to ergonomic substances our body is able to increase its efficiency, improve performance and speed up regeneration. The agmatine sulphate contained in the preparation belongs to the group of ergogenic substances that supports the body's exercise capacity. Agmatine sulphate, by increasing the production of nitric oxide affects the vascular endothelium function and reduces vascular resistance. It lowers blood pressure and enhances the muscle pump. This substance positively affects the blood supply and muscles and tissues oxygenation what makes it to be an ideal component of preparations allowing the increase of training volume and exercise capacity. Agmatine sulphate provides a strong foundation for making it independent, but equally effective a substance supporting the body during the intense physical exercise. The Prime Nutrition Agmatine containing pure agmatine sulphate, was created on such assumptions. Agmatine sulphate, has been subjected to numerous tests and observations. Not only it increases the synthesis of nitric oxide and intensifies the muscle pump, but it also presents other benefits. Experiments in rats show that agmatine stimulates the production of luteinizing hormone (LH). Increased levels of LH increase testosterone levels. By increasing testosterone levels, agmatine contributes to better hormonal environment required to muscle grow or to improve athletic performance. Available research results indicate that in mice agmatine improved insulin sensitivity and muscle tissue glucose uptake. Increased insulin sensitivity results in more efficient movement of glucose and amino acids to the muscles in order to grow or repair them. Subsequent observations showed that in rats agmatine intake increased appetite. An increased appetite leads to calorie intake, necessary for the muscle mass gain. 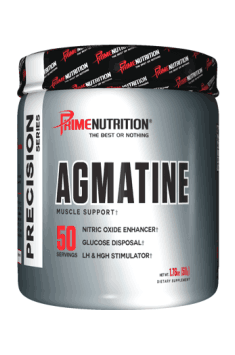 Prime Nutrition Agmatine’s main purpose is pre-workout supplementation. This product intensifies the muscle pump and improves vascularity and muscle endurance and performance. Not only it increases the body’s exercise capacity, but it can also be used in order to: improve the condition of the cardiovascular system and cognitive functions, improve the insulin sensitivity of tissues, increase testosterone levels, reduce pain and protect against oxidative stress. As a dietary supplement consume 1 serving (1 g) 30 minutes prior to exercise. Currently, there is no standardized dose of agmatine sulphate, and the figures given are determined on the basis of the results of tests carried out. Agmatine can be used for a variety of purposes: treatment of neuropathic pain (1000-2500 mg of agmatine per day) to improve cognitive function (200-500 mg), to expand blood vessels, intensify the muscle pump and to improve regeneration (500-1000 mg of agmatine 30 minutes before training). Arginine, citrulline and yohimbine may reduce the effectiveness of agmatine. Agmatine enhances the antidepressant action of lithium and strengthens the action of opiates (i.e. morphine) reducing pain. Prime Nutrition is a new line of nutritional supplements by Blackstone Labs (BSL) – an expansion of tried and true supplements that every male, female, athlete, or non-athlete can find to be beneficial to their health and overall quality of life. Efficient in prophylaxis and treatement of diseases of circulatory system.